2.1 You are permitted to use our website for your own purposes and to print and download material from this Website provided that you do not modify any content without our consent. The material on this website must not be republished online or offline without our permission. 6.1 We take all reasonable steps to ensure that the information on this Website is correct. However, we do not guarantee the correctness or completeness of the material on this Website. We may make changes to the material on this Website at any time and without notice. The material on this Website may be out of date, or on rare occasions incorrect and we make no commitment to ensure that such material is correct or up to date. 6.2 The material on this Website is provided without any conditions or warranties of any kind. To the maximum extent permitted by law, we provide access and use of this website on the basis that we exclude all representations, warranties and conditions which but for these Terms may have effect in relation to this Website. 7.1 Neither we nor any other party (whether or not involved in producing, maintaining or delivering this Website), shall be liable or responsible for any kind of loss or damage that may result to you or a third party as a result of your or their use of our website. This exclusion shall include servicing or repair costs and, without limitation, any other direct, indirect or consequential loss, and whether in tort or contract or otherwise in connection with this Website. If products are faulty or damaged we will offer a replacement or refund. Please return the product with its original packaging stating the reason for return. We will also refund postage costs. If you have tried the product and are unhappy with the results, then please contact us via email to ensure that you are using the correct and appropriate product for your skin's needs. It is also imperative that you follow the directions given. Some of the products we sell may have temporary side-effects for some people and these are usually resolved after a few weeks of use. We offer advice by e-mail if you need help choosing the right products before you buy. We will not refund or replace products that have been used or opened for hygiene reasons. If you have a reaction to a product, then please tell us and we will inform the manufacturer of the product so that they can update their adverse incidents of the product. We will not however refund against such a product that you have shown sensitivity to. 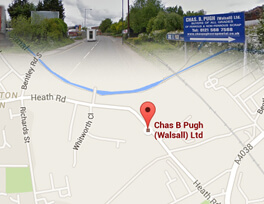 Our business address is: Heath Road, Darlaston, Walsall, WS10 8LP.